OVER 160 DESIGNS! A must have for every dog lover. Dog images in VECTOR .EPS and .Jpg format. 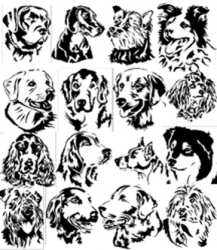 Over 160 different designs of the most popular breeds. This CD offers a variety from each of the Breed Classifications, Sporting, Herding, Working, Hounds, Terriers, Non-Sporting and Toy dogs. These images are perfect for gifts and pet memorials. Perfect for use with your Photo Image and Magnum Force stencil makers. This package is perfect for both high-speed engraving and the Jet Stream Blasting Systems.